Distributist Perspectives is a collection of essays by leading thinkers of the school of English Distributists that in the 1920s and 1930s articulated a humane vision of social and economic life based upon the Social Doctrine of the Church. Subtitled "Essays on the Economics of Justice and Charity," and including essays by Hilaire Belloc, G. K. Chesterton, George Maxwell, Harold Robbins, Cdr. Herbert Shove, H. J. Massingham, and Eric Gill, this first collection of Distributist writings serves as an introduction to the depth and coherence of the Distributist position on such essential topics as the nature of work, the role of tradition, the dangers of industrialism, and the importance to the family and the State of the widespread distribution of ownership of productive property. Volume I of the series offers a rare glimpse through true, primary source material, of the seriousness and persuasiveness of the critique of modernity by some of the finest English Catholic minds of last century. 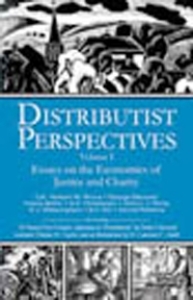 This first volume of Distributist Perspectives also offers a newly edited edition of the Distributist Manifesto, written by Arthur J. Penty for the Distributist League in 1937. 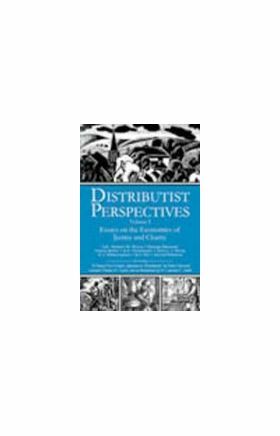 Launching the Distributist Perspectives series is a new essay on Distributism by Dr. Thomas H. Naylor and included in this first volume: "Averting Self-Destruction: A Twenty-First Century Appraisal of Distributism." Dr. Naylor is Professor Emeritus of Economics at Duke University where he taught economics, management science, and computer science for 30 years. He also taught at Middlebury College and acted as an international management consultant, serving governments and major corporations in over 30 countries. His articles have been published in such journals as The New York Times, International Herald Tribune, Los Angeles Times, Boston Globe, Christian Science Monitor, The Nation, and Business Week. Downsizing the U.S.A. and Affluenza are the most recent of his 29 books. IHS is also pleased to introduce Fr. Lawrence C. Smith, who has contributed the Introduction for Volume I. Fr. Smith was educated at DePaul University and Kenrick School of Theology. He has lectured in Theology at Franciscan University, and preached retreats at parishes and seminaries in Iowa, Missouri, Illinois, and Indiana. He has recently served as Parochial Vicar of Sacred Heart Parish (Newton, Iowa) and Immaculate Conception Parish (Colfax, Iowa). His writings have appeared in Gilbert! Magazine, The Catholic Yearbook, Lyrical Iowa, The Press-Citizen (Iowa City), and The Clinton Herald.